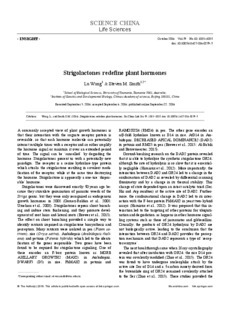 A commonly accepted view of plant growth hormones is that their interaction with the cognate receptor protein is reversible, so that each hormone molecule can potentially interact multiple times with a receptor and so either amplify the hormone signal or maintain it over an extended period of time. The signal can be ‘cancelled’ by degrading the hormone. Strigolactones present us with a potentially new paradigm. The receptor is a serine hydrolase-type protein which attacks the strigolactone resulting in covalent modification of the receptor, while at the same time destroying the hormone. Strigolactone is apparently a one-use ‘disposable’ hormone.